International Women’s Day (IWD) is recognized around the world – it is a day to reflect and celebrate. March 8th is dedicated to celebrating the accomplishments of women (across industries and across borders) while recognizing that there is still more work to be done. This year’s theme for IWD is “Press for Progress.” As of right now, gender parity is over 200 years away – the #pressforprogress campaign encourages us to think, act and be gender inclusive so that we can create more change (and do it faster). Kiran Gandhi serves as the perfect representative for this year’s theme. 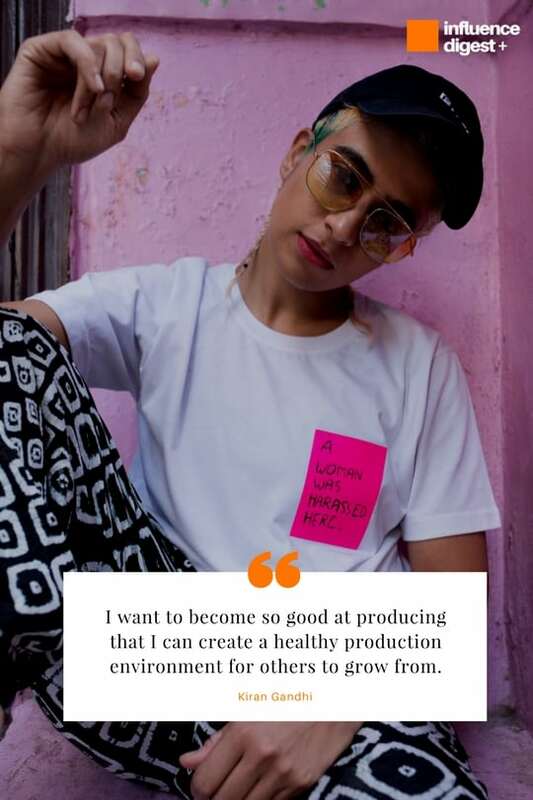 Sam, our editor-in-chief, had the opportunity to speak with Kiran, who is better known by the stage name, Madame Gandhi. 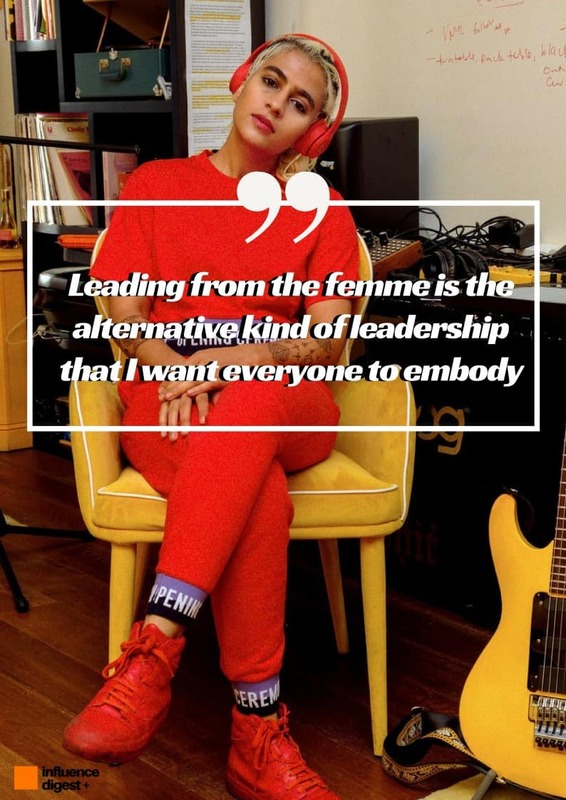 She’s got a lot of accomplishments under her belt – having toured internationally as a drummer for M.I.A. (yes, the “fly like paper, get high like planes” M.I.A. ), graduated with an MBA from Harvard, and made international headlines as the iconic free-bleeder from the 2015 London Marathon. Following the Women’s March on Washington in 2017, her single, “The Future is Female”, made it all the way to number eight on the Top 50 Spotify Charts in the United States. 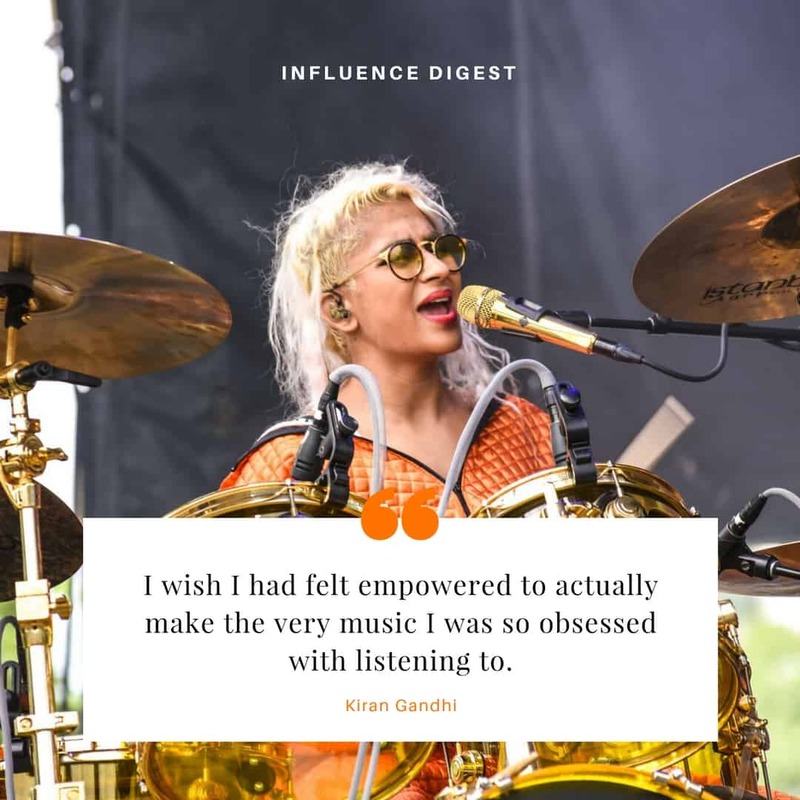 With all the varied experiences she’s had so far, we wanted to know her insights on the music industry, gender inequality and more. Influence Digest: Who is someone that has inspired you as a musician? So then I just started digging in – every song by Fela Kuti, not only inspired me because the music was so good, but because he was one of the few musicians I found that had influenced politics so effortlessly in his music. Influence Digest: Are there any artists that you wish you had discovered earlier? What song suggestions would you give your younger self? Madame Gandhi: I think I listen to so many of the artists I listened to when I was younger, so that wasn’t the issue. The messaging was always “of course, we’ll depend on someone else to produce for us” or “of course Kiran will be the drummer on someone else’s project.” The messaging wasn’t ‘what would it be like if you produced your own music or if you were the one learning Ableton on your computer?’ I wish I had someone to guide me in that direction sooner. Influence Digest: The music and nightlife scene is a very male-dominated space. How would you maintain a sense of agency when someone makes assumptions about you during soundcheck? Madame Gandhi: I step in with empathy. If we’re doing soundcheck and someone is rude right off the bat, of course, it’s part of their own internalized misogyny but it might also be because they’ve been mistreated by women, men, by any gender, in their line of work. Instead of letting their insensitivity get to me, I try to be peaceful and patient. When my authority is being undermined, I just continue leading the process forward. So If someone assumes that I don’t know something about a mic, I don’t let it get to me and I don’t feel the need to overcompensate elsewhere. It might be annoying when they tell me something I already know, but I also try to be encouraging, maybe nerd out over some cool equipment at the venue, and just bond with them about the fact that we get to play music that night. My favorite part of employing this strategy is watching sound teams at the start and the end of a show. At first, they don’t know anything about the project and have a bit of a guarded attitude. At the end of the night, this is the same group of people asking to take photos together, buying stickers and telling other people, “damn, that Madame Gandhi project is super dope.” And these are like big, security/bouncer dudes with tats – you would think they’re the opposite demographic of a feminist project. It can be such a beautiful and powerful way to communicate. Part of what I teach is employing those strategies in situations like the one you gave as an example. I don’t fight back or make them feel like I know everything – I try to approach situations with a team-player kind of attitude. Influence Digest: How do you go about musical collaborations? Madame Gandhi: I only align with people who share my value system. These are the kinds of people that are stoked to wear a Future is Female shirts, believe that gender fluidity and gender non-conformity is the way of the future. These are the people who are queer friendly. My collaborators are people who are aware of at least knowledge-seeking when it comes to inclusion & authentic diversity. I think everyone is on different parts of their path so I take two strategies I take when I consider collaborations. I work with people who are traditionally underrepresented and wouldn’t get certain opportunities that they are equally deserving of. If you look at my last remix album. We had only women of colour remix the record and I wanted those opportunities to go to super dope female producers. In other cases, when I really admire the production of someone that might be a cis-gender, white, straight man, I always have a tough time deciding if I want to go forward with that collaboration. If they’ve approached me because they like what I do or I’ve approached them because I like the quality of their work – I think there is something to be said about equal partnerships where both parties are respected as mutually equal collaborators. You know, parties that are equally taking control of their work; not where one person is the reputable (male) party or the other is the dependant (female) party. I also consider their own thirst for knowledge. In my studio sessions, it’s very spiritual – we’re having conversations, we’re talking about life. One of my favourite songs I’ve ever made is Bad Habits (it’s coming out this year!) and it was made with a dear friend of mine, Zach Witness. Sometimes we’d be in the studio and we couldn’t even get work done because we’re talking for six hours. Or laughing till we’re crying. The vibes were just so good. So these are some of the ways I analyze – I analyze if you are like me, and if you’re not like me (and you actually look like the oppressor), I see if you’re emotionally and intellectually curious to improve your own empathy and make the world a better place. Influence Digest: Have you experienced Imposter Syndrome? Madame Gandhi: I had more imposter syndrome as a student at Harvard Business School, not really as a musician. I felt insecure because I was a musician and came from a record label background. Even though I had worked a very corporate job at the record label, scored well on the GMAT, and was a math major before that, I felt imposter syndrome because people made me feel like the diversity card. I felt that that’s why I even got that opportunity. That can really get to you and make you really insecure. Interestingly, the thing that got me out of that was running. I was attracted to how raw and honest the sport of running is – like, if you run 5 miles no one can take that away from you. It’s not because you’re gay or straight, tall or short, it’s not because your parents have a certain connection – it’s just because you ran 5 miles. Running taught me that it’s not competing with other people, but becoming better version of yourself. I want to be the alternative to the misogynistic environments. I want to be so good that women and people that are more prone to those #metoo scenarios, have another option. So that motivates me to self-invest – I want to be a better version of myself so I serve the next generation and my community. Influence Digest: Being part of the Indian diaspora, how was your experience touring in India? Madame Gandhi: My experience was so beautiful – every single day I’d say that the goddesses are with me. I did the entire tour solo but beforehand, I would go online and link up with local, female musicians and artists. I’d send them my music and the setlist so that they could learn the songs – when I’d pull up to each of the cities, we’d have one rehearsal before the show. So there was an assortment of bands throughout the tour. That made me feel really good – I felt like I met so much local talent, I got to collaborate and I also felt like I made so many friends along the way. Doing the live shows with local talent became even more fun because they would invite me to after parties or invite me to stay at their place instead of the hotel. I discovered a really beautiful underbelly of artists creating in India. In Bangalore, there was an art installation that a producer had taken over, and he was running Ableton and projection mapping on the trees. It was an open installation that anyone could visit – it as amazing. In a city in the North of India, we did a show in a palace – a centuries-old palace! We danced and I got to perform with my friend Laura Lee from the band Khurangbin. I’m just smiling thinking about it’s all. On the closing night, I didn’t even know if anyone would come to the show in Bombay. Then it was completely packed. It was like the punk rock feminist show of my dreams. I can also tell that in India, young people are thirsty to engage in these political conversations that challenge social norms and restrictive career choices that impact both men and women.So I think everyone got a lot out of the tour because it’s all about personal freedom. Influence Digest: As women, and especially as women of colour, it feels like everything we do is politicized. How does this take shape in the music scene? I think it’s unfair to people that fall into those underrepresented groups (to people of colour, women, trans folks) because maybe they also just want to party and f**k? I encourage journalists to pay attention to the artists’ work. Pay attention to the artists own narratives and how they represent themselves. In a lot of my press photos, you’ll see me wearing a Future is Female shirt so it’s safe to say that there’s a political bend to my projects. But if those things aren’t central themes to someone’s music, that means that they don’t want to be asked “what does it mean to be a queer person in music?” because that’s not as important to them. And that’s okay- in fact, it’s really helpful. Because we need both: people that are actively talking about these issues and bringing awareness, and we also need people that are representing the very change of creating equality in the industry. We need those people to make it more normal for girls to pick up drumsticks and for a trans-identifying person to be a record label executive. So I think we need both – politicized and depoliticized music.